iPhone users, especially who have jailbroken their devices, frequently search for best antivirus software to install on their iPhone for safety and privacy concerns. Due to the continuous advancement of the hacking technique, people try to build their iPhones into a safe fortress because none wants to take risk with his/her confidential or private data, though iPhones are already very safe and secure. In such cases, Antivirus apps for iPhone become quite popular as it capable of blocking spam mails, any malicious and suspicious activities, as well as blocking unwanted ads and scripts from unauthorized sources. Along with these features, some antivirus software companies provide anti-theft feature too. 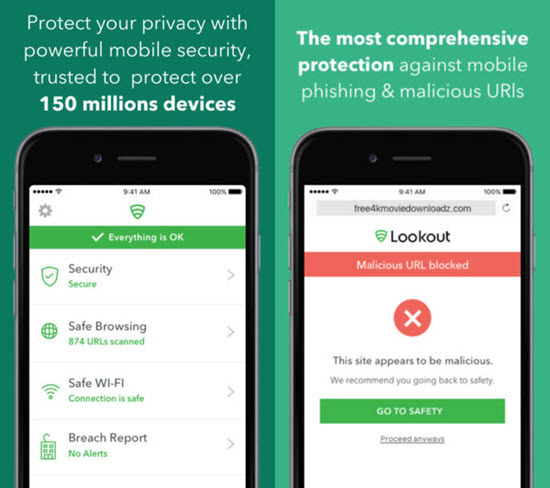 These antivirus apps act as a shield protecting your iPhone from hackers and spammers. All the online payment transactions will also be secured if you install the best antivirus software in your iPhone. Some antivirus software need to get paid but still some are free. We will list both paid and free type of antivirus apps for iPhone below. You can take a look on all the features and then select one of them to download and install in your iPhone. We also provide the downloading link along with the description of each app below. Among these you can choose your own antivirus app for iPhone according to your need. Bonus tips: If you lost important texts from iPhone, you can always use Gihosoft iPhone Data Recovery to recover your deleted text messages from iPhone with or without backup. Lookout is one of the best antivirus for iPhone which is quite capable of providing a tough shield on your privacy. 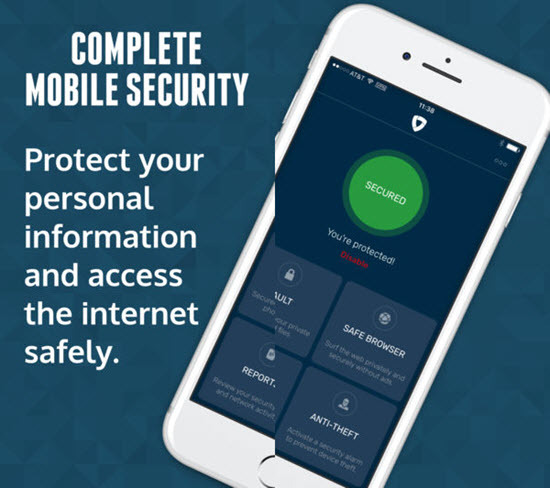 Like most of the antivirus apps for iPhone, this iOS app is also available in both free and paid versions.As the name of this application suggests, identity-theft protection is available as a key feature, while the secure Wifi feature is also popular among the users. The paid version is available by paying a subscription charges of $2.99 per month. The premium version of this iOS app will let you to explore a whole new world of advanced security features. You will surely get good returns from this app. McAfee is quite famous as one of the leading runners in the antivirus industry, and it also has developed a movile version dedicated for iPhone users. Though this iPhone antivirus application is not very impressive as compared to the above-listed app, the key highlighting feature is that it uses Touch ID or Face ID to protect your media library. The fast charging option will also get enabled after you install this application in your iPhone. Apart from these features, contacts will regularly get backup to avoid accidental loss. Developed and loaded with brilliant advanced security features, TM Mobile Security will be considered as the best antivirus for iPhone. The subscription charges are very high unlike the other antivirus applications; you have to pay almost 5$ per month to use the premium advanced features of this iOS application. Or you can use this app in free trial though some features will be disabled. Talking about the features of this application, the web browser filters are added to this application so that any type of malicious or suspicious activity can be blocked instantly with immediate effect. 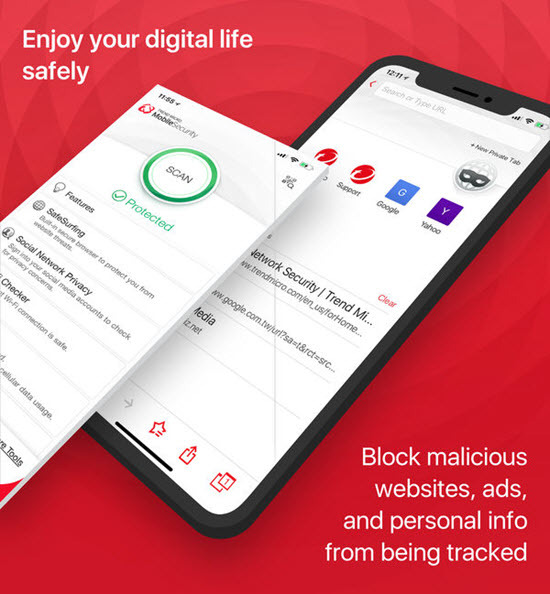 Like other antivirus iOS applications, Trend Micro Mobile Security provides you the basic security features like blocking spam mails, phishing protection, blocking of installation process from unknown sources etc. This is a must have antivirus application to protect privacy if you are an iPhone user. It is providing all the security features as you pay. 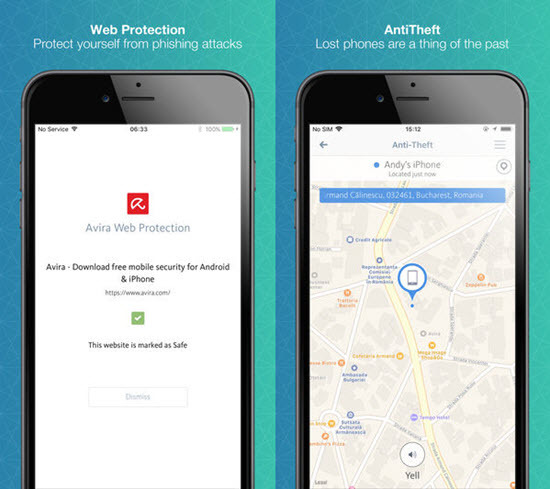 Avira Mobile Security is one of the finest available as free on App store for iPhone users. This best-in-class antivirus software will provide you all-round protection from the malicious and unwanted activities. This application will do real-time scan in your iPhone and hence eliminates all the viruses and unwanted programs. Blocking of spam mails, preventing the unwanted installation and downloads of files from unsecured websites are some other fantastic features which are offered by Avira Mobile Security. One other feature we would like to mention is the fast charging option, which enables you to fast charge your iPhone and to save battery as well. The overall graphic user-interface is also pretty attractive. Memory management is also an extra feature added in this iOS application. This feature will help you to scan the files as well as delete the unwanted and duplicate files very efficiently. You won’t worry about anything because installing this iOS application in your iPhone will definitely prove to be an asset for your iPhone. Mobile Security & Anti Theft Protection is also considered as one of the top best antivirus apps for iPhone users. It is available in both paid and free versions on App Store, and the paid version will mostly reduce the possibility that some hacker break into your device and steal your privacy. You can try a 3-day free trial to experience the paid version before you make a purchase. Similar to the Avira mobile security application, this iOS antivirus application will serve the same features sa phishing protection, blocking spam mails and unauthorized scripts from unsecured websites etc. The paid version will also provide you Anti-theft feature in addition. So, overall a good choice if you have some bucks in your pocket to secure your privacy. Now you reach the end. We hope that you can secure your precious data with one of these best antivirus software for iPhone mentioned above.You can try all of them for free and get the most suitable one. Also welcome to share your experience with these iOS applications in the comments sections. If you have any query related with these applications, you can leave a feedback too.